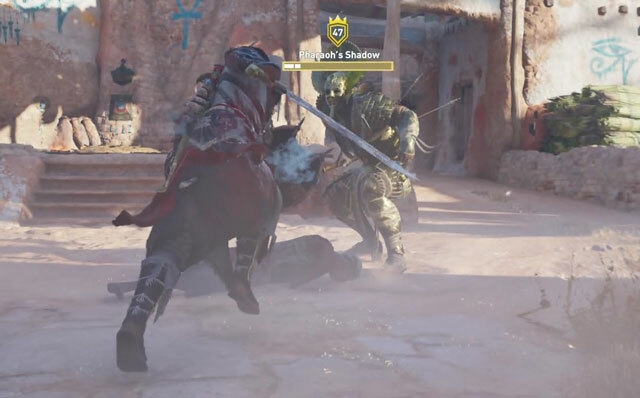 Pharaoh’s Shadow is one of the main quests in AC Origins: Curse of the Pharaohs. In order to complete it, you’ll have to defeat Ramesses’ Shadow, a mini-boss. It’s a specific Pharaoh’s Shadow enemy that looks different from the other ones. The problem is that the game doesn’t mark it on the map, and doesn’t tell you where to look for it. You can waste a lot of time looking for it, or you can take a look at our AC Origins Pharaoh’s Shadow quest guide and be done with it before you know it. We’re not entirely sure if Ramesses’ Shadow spawns in the same spot for everyone. It might be random. We found it at a crossroads in the eastern part of the city of Thebes. It looked a lot different than the other Pharaoh’s Shadows we encountered up to that point. It had golden armor, a large gold disk attached to the helmet, long hair and a pretty hefty mace. The shadow wasn’t there at first – it only spawned once we approached the middle of the little square. It wasn’t a difficult fight – we used the same tactic we use with all other mini bosses. Simply stay on your horse, circle the enemy and hit them with charged attacks whenever you can. The spawn is random, I had to rest/wait a few times until the right shadow spawned. Is this quest buged? I killed this guy 3 times now. every time i killed him, it told me that R’s Shadow has been killed, yet the mission still remains and i am up for nr. 4 now. If this persist i just won’t care about this mission anymore. No it’s not bugged. You keep killing the wrong shadow . The right one has a mace, not a spear. I’m already kill Ramsesse’s Shadow Before the Mission and now doesn’t appears. Before I killed Tutankhamun only he appears, but now doesn’t appears any shadows and I can’t move forward with the Pharaoh’s Shadow Quest. What can I do? You can hack the animus. Doing that made the shadows spawn again despite having lifted the curse.